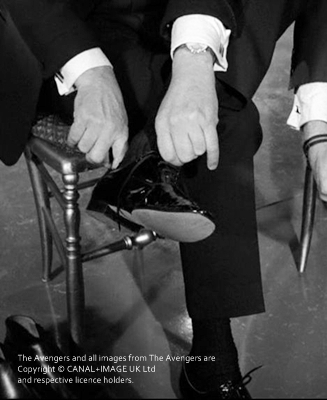 Without a doubt - John Steed is a well-dressed man. In many episodes, John Steed dresses or redresses, binds ties, and pulls his jacket or coat on or off. The rules of etiquette are always maintained. 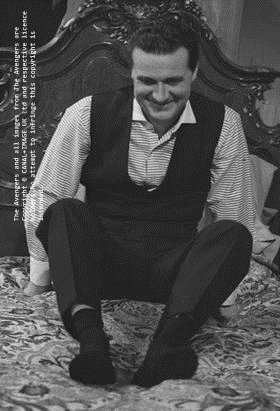 Steed in underpants is the maximum of what is on offer to the (female) fans, but there are also interesting sequences in which Steed is not dressed in a suit and bowler, but in his pajamas, or in casual leisure shirts with short sleeves. 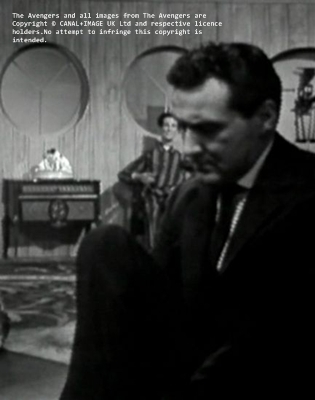 Except for the swimming trunks in The Removal Men, Steed never wears shorts (only a shorter one in The Thirteenth Hole). But at least there is the famous kilt in Castle De'ath. Although Steed is a perfect gentleman, he has some bad manners: he always put his shoes up on the sofa or the couch; not only at home but also in Mrs. Gale's flat. 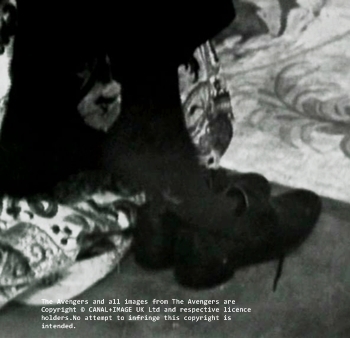 If he is lying on the bed, he usually wears only knee socks, as seen in Death of a Great Dane, The Master Minds, and Take-Over. We can only hope that he pulls off the shoes in the Turkish bath. 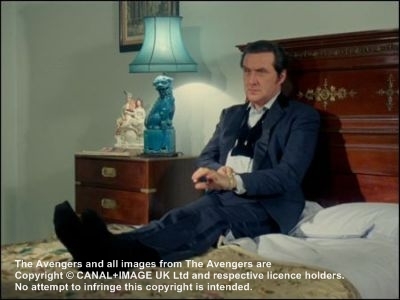 There are five episodes where Steed has (only) socks on: Death of a Great Dane, Too Many Christmas Trees (he manages to get rid of one shoe, then falls asleep), You'll Catch Your Death, Take-Over, The Master Minds (2x) and in Death of a Great Dane. He must tie the laces up after he has laid down on the bed. He pulls off one shoe too in Quick-Quick Slow Death to knock out one of his enemies. There it became an useful weapon (the shoe, not the sock) to knock out an opponent. The stylistic development of John Steed had already began during series one when trench-coated Steed changed his wardrobe against a three-piece suit, waisted jackets, elegant embroidered waistcoats, single-breasted tuxedos, sport jackets and sometimes even more casual clothing, such as turtleneck sweater or sweater in The Master Minds and The 13th Hole, the Hardy Amies Blazers in rough Irish tweed from series 3 episodes or the Nehru jacket in series 6. 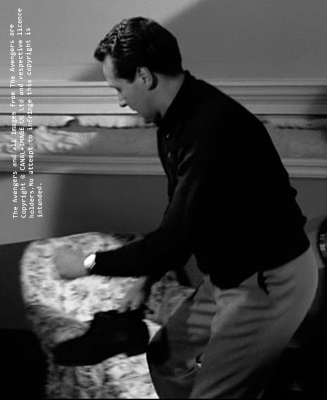 Most of the time Steed's was wearing Chelsea boots, but sometimes however lace and buckle shoes or boots, in some few episodes such as Too Many Christmas Trees and The Golden Eggs he wears slippers when he's at his flat. Steed (and Patrick Macnee) also like espadrilles, exclusivlely seen in the second series, such as in A Chorus of Frogs or The Removal Men. The idea for Steed's "dandified satorial style" wardrobe came from Sydney Newman and Patrick Macnee. Head of Wardrobe Department of the ABC was Ambren Garland. Responsible for Steed's wardrobe were Audrey Liddle, Francis Bolwell, Jackie Jackson; Patrick Macnee's tailor was a Mr Jones, cutter at Bailey and Weatherhill of Regent street. Steed wore fashion designed by Hardy Amies (series 3) and by Pierre Cardin during series 5 with it's typical hight fastening, double breasted jackets. In 1969 Macnee abandoned Cardin's wardrobe and returned to a style that matched Steed's way better: English tailored suits while he was on duty and informal clothes for the more domestic scenes. TNA Patrick Macnee's wardrobe somehow resurrected the satorial image of John Steed of the 60ths - the perfectly dressed gentleman with bowler hat and umbrella. Is there a barefoot Steed? Yes there is! In Too Many Christmas Trees Steed hangs up his stockings and it's the only episode that sees a barefoot Steed. There is the scene when he's having his Christmas nightmare; he's barefoot, walking through the (nightmare) forest of Christmas trees.